Following the market dynamic, TMT policies have been consistently trying to closely safeguard users' needs, orienting them towards increasingly sound principles of transparency and fair and non-discriminatory treatment by service providers. Following the repeal of the legal regime governing the personal radio service ‒ citizens' band (CB), as under the provisions of Decree-Law No. 1/2017 of 5 January, through a decision adopted on 9 March 2017, the National Telecommunications Authority (Anacom) has determined an exemption from licensing for CB stations and from the corresponding amendment of the National Table of Frequency Allocations.2 The adopted decision defines the harmonised technical provisions that govern the functioning of CB stations. As a result of the SIMPLEX+ 2016 programme, CB stations are now under the general radiocommunications regime that exempts registration if certain requirements are met. The radio communications regime has been highly dynamic in 2017 and 2018. Radio spectrum is a scarce resource whose use is repeatedly the target of regulatory and legislative measures at both the European and national level that aim to regulate and discipline its use. Decree-Law No. 57/2017, published on 9 June, establishes conditions governing the use of radio and other equipment that has a bearing on the spectrum's efficient use. With such amendments in mind, Anacom launched an information campaign on 28 September 2017 to provide economic operators with information about the new legal regimes applicable to radio and electronic communications equipment, and on the placement and availability of this equipment on the market. The campaign's aim is to warn operators in the distribution chain handling such equipment that they can now be held equally responsible for compliance with the prevailing rules, such as manufacturers, agents, importers and distributors of equipment using the electromagnetic spectrum. Portugal's Testing and Calibration Laboratory checks that such equipment is compliant with the essential requirements to which it is subject when placed in the market, as well as the requirements that result from such equipment's entry into operation within the framework of the Radio Equipment Directive3 (under Decree-Law No. 57/2017 of 9 June) and the Electromagnetic Compatibility Directive (under Decree-Law No. 31/2017 of 22 March). Radio equipment conforming to Decree-Law No. 192/2000 that was placed on the market before 13 June 2017 may continue to be made available on the market or put into service. On 15 June 2017, the 'roam like at home' initiative was launched following a decision of the European Parliament on 6 April 2017, with maximum wholesale roaming prices being approved following a political agreement reached at the beginning of the year. The agreement was the result of a long process dating back to 2013 with the first draft proposal of the Telecom Single Market (TSM) Regulation.4 Alongside this decision is a set of detailed rules on the application of a fair use policy, the methodology for assessing the sustainability of abolishing retail roaming surcharges and the applications to be submitted by roaming providers for the purposes of such assessment.5 To avoid abusive or anomalous use of the system, the Portuguese national regulatory authorities (NRAs) also have powers to intervene if the ending of roaming charges leads to price increases for domestic customers. In this respect, on 28 March 2017 the Body of European Regulators for Electronic Communications (BEREC) published its BEREC Guidelines on Regulation (EU) No. 531/2012, as amended by Regulation (EU) 2015/2120 and Commission Implementing Regulation (EU) 2016/2286 at the retail level. These Guidelines are complementary to the provisions set out in the Roaming Regulation, and NRAs must to take them into account when supervising the Roaming Regulation in their Member States. To be in harmony with this informal political agreement of the Parliament, the Council and the Commission, and at the express request of Apritel (the Portuguese association of operators), under a decision of 20 February 2017,6 Anacom approved the opening of a procedure to amend the Regulation on pre-contractual and contractual information.7 On 20 March 2017, a new notice8 announced that the effects of that Regulation have been suspended, which suspension took effect from 23 February 2017 and will remain in place until the entry into force of the amendment to Regulation No. 829/2016 of 23 August. This decision aims to enable a different approach for the simplified information file form and system. Statistics show9 that by the end of the third quarter of 2017, nine out of 10 families had bundled services. The number of subscribers to these deals reached 3.7 million (254,000 more, or an increase of more than 7.4 per cent, compared to the equivalent quarter of the previous year, which represents the highest growth recorded in the past four quarters).10 This growth is mainly due to the quintuple play (5P) bundled deals offering (FBB+FTS+STV+MTS+MBB), which gained more 46,000 subscribers, followed by the third play (3P) FTS+FBB+TVS offer with more 28,000 subscribers, which represents 82.3 per cent of total subscribers, with approximately 1.5 million subscribers each. Convergent bundles, which combine services provided in a fixed location with mobile services, reached 1.7 million subscribers (3.9 per cent more than in the previous quarter) and already represent 46.9 per cent of the bundled offers. In the quarter under review, MEO – Serviços de Comunicações e Multimédia (MEO) had the highest share of bundled subscribers (39.9 per cent), followed by NOS Group (38.5 per cent), Vodafone (16.7 per cent) and NOWO/ONI (4.8 per cent). The NOS Group continues to lead in the 3P and 4P bundles (with shares of 36.2 and 75.7 per cent, respectively), while MEO led in the 2P and 5P bundles (43.4 and 48 per cent, respectively). Between January and September 2017, revenues from bundled services increased to €1.3 billion, an amount corresponding to an increase of 5.9 per cent compared to that recorded in the same period of the previous year. MEO had a share of 41.4 per cent of revenues, followed by the NOS Group with 40.6 per cent, Vodafone with 14.7 per cent and NOWO/ONI with 3.3 per cent. The NOS Group had the highest share of revenues from 3P and 4P bundles (38.9 and 79.4 per cent, respectively), while MEO led the 2P and 5P bundles (38.8 and 48.5 per cent, respectively). mobile phone services: consumption simulation (2,374 accesses). Postal traffic continues to decline annually as a result of the increasing replacement of postage services by electronic communications.16 In the third quarter of 2017, total traffic from postal services in Portugal totalled about 179.1 million objects, falling by 7.1 per cent versus the third quarter of 2016. Despite this decline, revenues from postal services increased by 0.7 per cent, rising to €152 million. Traffic from postal parcels made up 27 per cent of total revenues versus 26.4 per cent in the same period of 2016. The increase in 2017 (over €113,000) reflects the fact that the last year of the transitional period provided for in the legislation terminated,17 which translated into the additional coverage of more 20 per cent of administrative costs of regulation, compared to 2016. Universal postal service traffic, which represents 84.1 per cent of total traffic, decreased by 8.5 per cent from the same period in 2016. On average, each inhabitant sent 17.4 postal items in the third quarter of 2017, which is 1.3 fewer items per capita compared to the third quarter of 2016. Grupo CTT (CTT) retained a share of 91.7 per cent of total postal traffic. Anacomhas again stated that the company is abusing its dominant position by refusing its competitors access to its standard mail delivery network since 2012, in breach of national and EU competition rules.18 Consequently, Anacom, approved, on 2 February 2017, a draft decision on the disclosure of information on letter boxes by CTT, and CTT had, among others, to disclose information about letter boxes located on public roads and in public places where users could deposit items of correspondence into CTT's postal network. On 28 December 2017, the Portuguese Competition Authority (AdC) tackled the same abusing of a dominant position by CTT, opening an administrative infraction proceeding for indications of infringement of the competition rules. The AdC's investigation identified a set of fair competition concerns related to access to CTT's traditional mail distribution network by competing postal operators. Given that competing postal operators require access to the postal distribution network of CTT in order to be able to provide traditional courier services to business customers, the AdC preliminarily considered that the behaviour of CTT could have a restrictive effect on competition by creating barriers to the development of effective competition in the traditional mail market. Addressing the AdC's concerns, CTT committed to, for example, extend to competing postal operators the postal services covered in its access offer, namely the national editorial service, the national priority service and the national registered service, among others.19 The AdC is keeping a close watch on CTT's commitments and monitoring its activities. On 2 February 2017, Anacom began drawing up a regulation concerning the registration of companies that offer electronic communication networks and services, culminating in Regulation No. 6/2018, published on 5 July 2018. The objects of the present Regulation include the establishment of notification obligations imposed on undertakings that offer or intend to offer ECNs and services as regards identification and contact details, and the commencement, modification and discontinuation of their activities. The Regulation also sets out the rules governing the maintenance of undertakings' registration with Anacom, all with a view to pursuing the principle of good administration. Among Anacom's recommendations in 2017, we highlight the end of the universal fixed telephone service. Having considered that the scant demand for the services covered does not justify maintaining the contract for a universal fixed telephone service between the state and NOS Comunicações, Anacom recommended, as per the terms established in 2014, that the government end it. In view of this data, Anacom considers that there is evidence that the objectives underlying the universal service contract for this provision are being accomplished by the market on a competitive basis. Without disregarding the policies and legislative changes mentioned above, net neutrality was undoubtedly one of the most important topics in the TMT industry in the present year. Following the entry into force of the Telecom Single Market (TSM) Regulation, Anacom closely followed BEREC's (30 August 2016) Guidelines20 concerning the implementation by national regulators of the European net neutrality rules by ensuring compliance with the rules to safeguard equal and non-discriminatory treatment of traffic in the provision of internet access services and related end user rights. Proof of such commitment was seen in an Anacom order of February 2018 giving operators 50 working days to amend zero-rated and other similar offers made available by providers of mobile internet access where these offers violate the provisions of the TSM Regulation and the Roaming Regulation as regards net neutrality and roaming rules. This order stems from Anacom's oversight of existing offers, whereas a thorough investigation detected situations where providers employ traffic management practices that differentiate between general traffic allowances and specific traffic allowances or applications not subject to traffic limits in violation of the net neutrality rules. It has also been found that, in some cases, specific data allowances cannot be used by customers when travelling in the European Economic Area (EEA) on terms equivalent to those that apply in Portugal, which is contrary to the roam-like-at-home principle. In view of these findings, Anacom decided to order providers of internet access services to amend their procedures in offers that include mobile internet access services (including mobile phone internet services) in cases where there is a differentiated treatment of traffic. This differentiated treatment has been seen between applications and content included in specific data allowances or those made available without traffic limits and other applications and content included in general data allowances, applied once general data allowances have been exhausted. Anacom's determination applies to any offer with these characteristics, even if not specifically referenced in Anacom's analysis. Anacom has also ordered providers to amend procedures (within the same 50-day deadline) in the case of offers where content and applications are subject to conditions of use when customers are roaming in the EEA that are not equivalent to the conditions applied to use in the national territory. We also highlight the following regulatory and legislative developments. The Electronic Communications Law was amended by Decree-Law No. 92/2017 of 31 July 2017 reinforcing measures to reduce the cost of implementing high-speed ECNs by transposing Directive 2014/61/EU. Law No. 49/2015 of 5 June establishes private copying levies over digital devices such as mobile phones, smartphones, tablets and scanners, as well as support equipment (USBs, external drives, MP3 and MP4 players, memory cards, etc.). The approval of this Law was highly controversial: the President vetoed it, but it was subsequently reapproved unchanged by a qualified majority in Parliament. To date, the Law has not undergone any revision or amendment. Law No. 78/2015 of 29 July establishes new rules with regard to the ownership, management and financial transparency of media undertakings. The Law entered into force on 30 October, and the first disclosures of ownership and management to the regulator occurred on 30 January 2016. To enable media undertakings to comply with the legislation, the Transparency Digital Platform was created. Through this Platform, all media undertakings must communicate to the Regulatory Authority for the Media (ERC) the relationship of holders for their own account or for the account of others, and the usufructuaries of shareholdings in entities that carry out communication activities, together with the composition of their corporate bodies and the identification of the person in charge of the editorial orientation and supervision of the contents. Online gambling has been a regulated legal activity in Portugal since 2015. Decree-Law No. 66/2015 of 29 April regulates online gambling, betting and gaming, which was later amended by Law No. 114/2017 of 29 December. At the end of the first quarter of 2018, there were seven entities authorised by the Gaming Commission of the SRIJ (Regulatory Service and Gaming Inspection) to engage in online gaming and gambling activities in Portugal, which is three more than were authorised in the same period of 2017. The mentioned activities have generated around €33.8 million gross revenue, a value of around €2.5 million more over the same period in the previous year. The Portuguese Premier League remained the largest betting player, accounting for 14.7 per cent of the total amount of bets placed on football in the period under review. Concerning the scope of data protection, notwithstanding the General Data Protection Regulation21 (GDPR) being approved on 27 April 2016 and coming into force in 25 May 2018, to date, Portugal does not have data protection legislation in place that implements the GDPR. Portugal has two independent sectoral regulators: Anacom in the scope of communications, and ERC with regulatory competence in the media sector. Although both regulators have responsibility for the promotion of competition and pluralism in their respective sectors, this does not preclude the powers vested with the AdC. In fact, regarding matters related to the application of the legal framework for competition in these respective sectors, Anacom, ERC and the AdC must cooperate and collaborate, and pay due regard to their respective powers. The statutes of Anacom (formerly ICP-Anacom) were approved by Decree-Law No. 39/2015 of 16 March, under which Anacom is endowed with regulatory, supervisory, monitoring and sanctioning powers. It is also incumbent upon Anacom to promote out-of-court dispute settlement mechanisms between providers subject to its regulation as well as consumers and other end users of electronic and postal communications. Anacom is a legal person governed by public law and statutes, and is independent from the government at the organisational, functional, technical and financial levels. Anacom is not subject to government oversight or authority in connection with its functions, and members of the government are not allowed to make recommendations or directives with regard to Anacom's regulatory actions or the priorities it will adopt. some aspects of information society services, namely e-commerce. Regarding radio and television, the broadcasting and management of the spectrum are subject to Anacom regulation and supervision. Law No. 5/2004 of 10 February (as subsequently amended and republished by Law No. 51/2011 of 13 September) is the main act regarding electronic communications (Electronic Communications Law). It establishes the legal regime applicable to ECNs and services and to associated services, and defines the assignment of Anacom in this field. The Electronic Communications Law adopted Directives No. 2002/19/EC, No. 2002/20/EC and No. 2002/21/EC of the European Parliament and of the Council of 7 March, amended by Directive No. 2009/140/EC of the European Parliament and of the Council of 25 November, and Directive No. 2002/22/EC of the European Parliament and of the Council of 7 March, amended by Directive No. 2009/136/EC of the European Parliament and of the Council of 25 November, and 2002/77/EC of the Commission of 16 September. In the field of e-commerce, the main act is Decree-Law No. 7/2004 of 7 January (as subsequently amended), which transposed into the Portuguese legal system Directive 2000/31/EC of the European Parliament and of the Council of 8 June 2000 on certain legal aspects of information society services, in particular electronic commerce, in the internal market. With regard to data protection, the main sources of law are the GDPR and, to the extent it does not conflict with that, Law No. 67/98 of 26 October, which transposed into the Portuguese legal system Directive 95/46/ EC of the European Parliament and of the Council of 24 October 1995 on the protection of individuals with regard to the processing of personal data and on the free movement of such data, and Law No. 41/2004 of 18 August (as subsequently amended) concerning the processing of personal data and the protection of privacy in the electronic communications sector, which transposed Directive 2002/58/ EC of the European Parliament and of the Council of 12 July, and Directive 2009/136/EC. In the postal area, the main source of law is Law No. 17/2012 of 26 April (as subsequently amended), which lays down the legal regime that governs the provision of postal services under a full competition regime in the national territory, as well as international services to or from the national territory, and transposes into the Portuguese legal system Directive 2008/6/EC of the European Parliament and of the Council of 20 February 2008. The media sector is regulated by ERC. ERC is an independent regulator that is not subject to recommendations or directives from the government or any other political body. The exclusive competence of ERC is restricted to the activity of media companies from the perspective of freedom of speech and the content of media, and this competence should not collide with the competence of other regulators. In this regard, on 18 July 2018 ERC issued a set of guidelines to encourage standards of good practice by the media under Portuguese jurisdiction to cover forest fires and other calamities: the Guide to Good Practices. Unfortunately, in 2017 and the third quarter of 2018, forest fires in the interior of the country mobilised a significant amount of media coverage, which gave rise to numerous complaints to ERC regarding the journalistic coverage of that news, raising the need for an analysis by the regulator of the journalistic practices adopted in these types of circumstances. More important than analysing the past is undoubtedly the promotion and implementation of good practices for the future. In this respect, it is important to note that radio and television broadcasting and the management of the spectrum is under Anacom regulation and supervision. The Radio Act (Law No. 54/2010 of 24 December, as subsequently amended) concerning access to and pursuit of radio broadcasting activity in the national territory. The Television Act (Law No. 27/2007 of 30 July, as subsequently amended), which regulates access to and performance of television activities. This Law transposes into national law a part of the provisions of Council Directive No. 89/552/EEC of 3 October, as amended by Directive 97/36/EC of the European Parliament and of the Council of 30 June, and Directive No. 2007/65/EC of the Parliament and of the Council of 11 December. Law No. 78/2015 of 29 July governs the promotion of transparency with regards to the ownership, management and means of financing of media undertakings. The Law entered into force on 30 October 2015. The annual corporate governance report shall be delivered by 30 April each year to ERC and shall include a 'truthful, complete, objective and current report on corporate governance structures and practices adopted by media companies'. In short, this regulation establishes that media companies are required to provide information on equity, liabilities, ownership and holding of corporate bodies, and related business activities. The Press Act (Law No. 2/99 of 13 January) governs the basic principles of media content and freedom of speech. Regarding data protection, the Portuguese Data Protection Authority (CNPD) is responsible for monitoring compliance with the GDPR. In contrast to what was the case under the previous Portuguese Data Protection Law,22 the role of CNPD, now that the need for prior notification or for prior authorisation has disappeared, is mostly of a supervisory nature. The space where radio waves may propagate constitutes a public domain of the state, and Anacom is responsible for the management of the spectrum in coordination with the European Commission and the regulatory authorities of other Member States with regard to strategic planning, coordination and harmonisation of the use of radio spectrum in the European Union, namely in the scope of multiannual radio spectrum. The allocation of spectrum and the assignment of frequencies should be based on objective, transparent, non-discriminatory and proportionate criteria. The management of spectrum is subject to the principles of technology neutrality, in accordance with which all types of technology used for ECSs may be used in frequency bands declared to be available for ECSs, and are published in the National Frequency Allocation Plan as such; and service neutrality, in accordance with which all types of ECSs may be provided in frequency bands declared to be available for ECSs, and are published in the National Frequency Allocation Plan as such. Licences for the use of frequencies are granted for 15 years and are renewable. The use of numbers depends on the allocation of rights of such use. Such rights may be allocated both to providers and users, and the law warrants that the allocation procedure must be open, objective, transparent, non-discriminatory and proportional. The use of radio communications networks and stations is also subject to licensing. Anacom is responsible for granting licences, and the licensing procedure is ruled by Decree-Law No. 151-A/2000 of 20 July, as further amended. Anacom has announced that use of the 1850-2000kHz band has been authorised, under conditions set in the National Table of Frequency Allocations for the 1830–1850kHz band, for the purpose of taking part in a number of specific contests in 2018. This authorisation for temporary use of the 1850–2000kHz band does not allow it to be used for any other purpose in the scope of amateur service or for any other radiocommunication services. With regard to television broadcasting, the licensing regulation differs according to whether there is an allocation of the terrestrial spectrum. Licences to broadcast using the terrestrial spectrum are subject to public tenders. These can be public tenders for unrestricted free-to-air television programme services, and for conditional access television programme services or free-to-air television programme services subject to a subscription. If the proposed broadcasting activity does not use the terrestrial spectrum, authorisation is given upon the request of interested undertakings. A simple registration is needed where the television activity consists of the broadcast of television programme services exclusively through the internet that are not retransmitted by other networks. Access to radio broadcasting activity is also regulated. Radio broadcasting is conditional upon the issue of a licence by means of public tender, or of an authorisation, according to whether programme services to be provided will use the terrestrial broadcast spectrum. Radio broadcasting through the internet is only subject to registration. Illegal television activity and illegal radio activity are both considered criminal activities that are subject to a term of imprisonment of up to three years or to a daily pecuniary sanction for up to 320 days. The TMT market is fully liberalised, and there are no foreign ownership restrictions with regard to telecom services or networks, without prejudice to the application of the legal regime of competition in the electronic communications sector. However, there are several ownership and market restrictions in the media sector that have to be taken into consideration. Television and radio cannot be controlled or financed by political parties or associations, local authorities or their associations, trade unions, or employer or professional associations; furthermore, radio broadcasting activities cannot be pursued directly or indirectly by the state, autonomous regions, local authorities or public institutions unless such activity is exclusively performed through the internet and consists of the organisation of institutional or scientific programme services. Additional specific concentration and cross-ownership restrictions apply to television and radio activities. Concentration operations between media operators that fall under the intervention of the AdC are subject to a prior opinion of ERC that will be binding where there is deemed to be a risk to free expression and pluralism. Changes of control are prohibited during the first three years of the licence, and thereafter are subject to the prior consent of ERC. An undertaking also cannot hold more the 50 per cent of the licences for national unrestricted free-to-air television programme services, and there are cross-ownership restrictions with regard to radio both at the national and local level. shareholders' agreements, special financial movements and corporate governance rules have to be disclosed to ERC, and certain specific information about the shareholders must be published on the operator's website. Regarding the right of use of frequencies and numbers, the general rule is that such rights are transferable upon prior notification to Anacom, which may oppose the transfer or impose conditions to avoid distortion of competition. In this case, the AdC shall give a prior opinion. Licences and authorisations for television activity are non-transferable. Radio licences and authorisations at the local level are transferable, subject to the prior authorisation of ERC, without prejudice to the assignments granted by Anacom as the national communications regulatory authority and by the AdC. Internet services are regulated by the Electronic Communications Law24 and by the E-Commerce Law,25 and such activity is not subject to prior authorisation but only to prior notification to Anacom. supply lists of owners of hosted websites. Currently, the following activities are covered by USOs: fixed telephone services, public pay telephones, and telephone directory and directory enquiries services; the postal area; and radio and television. As a general rule, prices are not regulated, but operators are subject to the obligation of the cost-orientation of prices. Anacom may intervene in cases of a dominant position and may require prices to be adjusted. For instance, by decisions adopted on 13 July 2017, and after a prior hearing of the interested parties, Anacom has ordered MEO, NOS, NOWO and Vodafone to adopt corrective measures that entail sending written communications to subscribers affected by contractual changes made upon the initiative of these operators. This requirement applies in situations where such contractual changes (made subsequent to the entry into force of Law No. 15/2016 of June 17) were not communicated to the customer in tandem with the information that, in cases where customers do not accept the changes in question, the customer has the right to terminate the contract without any charge (even if the customer was subject to contract lock-in periods or other commitments to stay). Through this decision, Anacom announced that it had noticed the existence of some constraints in the termination of contracts for customers who received communications sent by operators in compliance with the previously mentioned corrective measures. In view of this, on 23 August 2017 Anacom alerted customers wishing to exercise their right of withdrawal that they may do so not only in person in any store or by telephone, but also in writing through any of the contact methods indicated in their respective contracts or those disclosed to the public (address, fax, email address, etc. ), or through the customer area of an operator's website. A request for termination does not depend on the submission of any documents other than those that are strictly necessary for the confirmation of a subscriber's identification.28 If customers wish to keep their telephone numbers, they have three months to request the use of such numbers with the same operator or to ask for their portability. a new mechanism to validate subscribers in electronic portability requests has been introduced: this validation is designed to reduce the number of electronic requests refused due to a lack of subscriber identification data at the originating provider or holder. As regards procedures between companies with portability obligations, the sending of contract-terminating documentation has been limited to situations of portability not requested by subscribers, at the same time entailing a requirement that the recipient provider keeps this documentation. In terms of tariff transparency, the announcement that a call is being made to a ported mobile number will only be made available where expressly requested by the end user. Anacom also regularly issues guidelines regarding terms and conditions for end users, and operators must submit for approval all standard contracts with customers. Unsolicited communications (e.g., automated calling machines, facsimile machines (i.e., faxes), email, SMS, EMS, MMS and other similar applications) are subject to prior and explicit consent from the user (opt-in), except if the user is a legal person, in which case the opt-out rule applies. opting out is simple and free of charge. In addition, providers shall keep, themselves or through representative bodies, an up-to-date list of the natural users who opted in to receive unsolicited communications as well as of users who did not object to receiving these, and of the legal users that opted out. Following the recent and devastating effects of the terrible fires that afflicted Portugal in the summer of 2017, Anacom recommended on 31 October 2017 that companies offering electronic communication services should not charge customers for the time period during which they had no telecommunications services due to the fires. While it is not in dispute that the suspension of services was not due to a voluntary act of the provider or due to an act attributable to the provider, there is also no question that the deprivation of services is likewise not attributable to subscribers, and there is no justification for penalising subscribers with the burden of paying for a service that they did not enjoy. However, the Electronic Communications Law does not establish any obligation to deduct days of non-availability of a contracted service from customer bills. Nevertheless, Anacom considers that service providers should arrange, upon their own initiative, an adjustment of the amounts charged, performing what is considered to be, above all, under an imperative of fairness. Anacom also intervened, requesting that the interrupted telecommunications services should be put back in place as quickly and effectively as possible, having also promoted the identification of measures for the security and resilience of communications infrastructures, and the establishment and operation of efficient warning systems for the population in emergency situations. Freedom of access to information and self-expression are constitutional rights. Nevertheless, such rights can be limited under legally foreseen terms (e.g., judicial secrecy, state secrets). In addition, the electronic communications sector is ruled by the protection of privacy principle (Law 41/2004 of 18 August, subsequently amended by Law 46/2012 of 29 August on the processing of personal data and the protection of privacy in the electronic communications sector that transposed Directives 2002/58/EC and 2009/136/EC). However, this protection of privacy rule has some exceptions, such as those that are strictly necessary for the protection of activities concerning public security, defence, state security, and the prevention, investigation and prosecution of criminal offences, under the terms established in special legislation. Take appropriate technical and organisational measures to ensure the security of their services and at least the following: measures that ensure that personal data can be accessed only by authorised personnel, and only for legally authorised purposes; the protection of personal data transmitted, stored or otherwise processed against accidental or unlawful destruction, loss, alteration, and unauthorised disclosure of or access to such personal data; and measures that ensure a security policy with respect to the processing of personal data. In order to allow them to take the necessary precautions, without undue delay notify the personal data breach to the Data Protection Authority (CNPD) and, where the personal data breach is likely to adversely affect the personal data of a subscriber or user (i.e., where the breach could result in, for example, identity theft or fraud, physical harm, significant humiliation or damage to reputation in connection with the provision and use of publicly available communications service), the subscriber or user. Ensure the inviolability of communications and related traffic data by means of public communications networks and publicly available ECSs, which means that any interception or surveillance of communications and related traffic data by persons other than users is prohibited without the prior and explicit consent of the users concerned, except for cases provided for in the law (criminal procedures); and any legally authorised (by the CNPD) recording of communications and related traffic data when carried out in the course of lawful business practices for the purpose of providing evidence of a commercial transaction, provided that the data holder has been informed thereof and given his or her consent thereto. Not store information or gain access to information stored in the terminal equipment of a subscriber or user (e.g., cookies, web beacons) unless with his or her prior and informed consent, or if required for carrying out the transmission of a communication over an ECN, or the provision of a service explicitly requested by the subscriber or user. Erase or make traffic data relating to subscribers and users that have been processed and stored anonymously where they are no longer needed for the purpose of the transmission of a communication, except the data strictly needed for billing purposes and only up to the end of the period during which the bill may lawfully be challenged or the payment be pursued, unless with a subscriber or user's prior, explicit and informed consent, which can be withdrawn at any time, and to the extent and for the duration necessary for the purpose of marketing ECSs or for the provision of value added services. Process location data provided that they are made anonymous or, to the extent and for the duration necessary for the provision of value added services, with a subscriber or user's prior, explicit and informed consent, which can be withdrawn at any time. Reconcile the rights of subscribers receiving (those who want) itemised bills with the right to privacy of calling users and called subscribers. Provide transparent and up-to-date information on the several possibilities regarding identification of calling line and connected line. Cancel (with a prior opinion of the CNPD), where compatible with the principles of necessity, appropriateness and proportionality, for a period of time not exceeding 30 days, the elimination of the presentation of the calling line identification on a written and duly substantiated request from subscribers who wish to determine the origin of non-identified calls that upset the peace of their family or the intimacy of their private life. Ensure that any subscriber has the possibility, using a simple means and free of charge, of stopping automatic call forwarding by a third party to the subscriber's terminal equipment. Inform subscribers or users, free of charge and before the respective data are included in printed or electronic directories available to the public or obtainable through directory enquiry services, and collect their consent for such purposes, being the subscribers or users entitled to choose the personal data they want to be displayed in such directories. the location of mobile communication equipment. The retention and transmission of data is exclusively intended for the investigation, detection and prosecution of serious crimes by the competent authorities, and the transmission of data may only be ordered or authorised by a reasoned court order. In addition, files intended for data retention within this Law must be stored separately from other files with different purposes, and (except for data on subscribers' names and addresses) must be blocked as from the moment they are retained, only being unblocked in the event of transmission to the competent authorities. Despite the fact that this data retention law has not been declared invalid by the Portuguese courts, the CNPD, in line with the arguments of the Court of Justice of the European Union in the Digital Rights Ireland, Ltd and Tele2 judgments,30 has already recommended that the Portuguese legislator review Law 32/2008 to make it compliant with the Charter of Fundamental Rights of the European Union and with the Portuguese Constitution. There are no specific provisions as far as children are concerned within the data protection laws, or regarding their protection online. However, the CNPD through Project Dadus (which is currently on hold), as well as the Ministry of Education in conjunction with other public and private entities through Project SeguraNet, aware of the need to educate children (at all ages), teachers and parents on privacy issues, particularly online, have been developing several initiatives and making available resources to create awareness, train and test all the educational community on how to protect children's privacy and their personal data as well as to allow them to have a safer experience online. Raising awareness about the dangers of the online world is of major importance, as the latest statistics revealed by Anacom, on World Children's Day, show that 83 per cent of children between 10 and 12 years old have a mobile phone, a figure which rises to 97 per cent for those between 13 and 17 years old. to pursue a strategy of prevention, raising awareness and educating organisations in particular, and civil society in general, on issues of cybersecurity, thus contributing to creating a community of knowledge and a national culture of cybersecurity. More recently, on 24 August 2017, the High Council for Cyber Security was created to coordinate the political and strategic landscape for cybersecurity as well as to monitor the implementation of the National Cyber Security Strategy and its revision. It is also worth mentioning the Cybercrime Law (Law 109/2009 of 15 September), which implemented Council Framework Decision 2005/222/JHA and establishes the substantive and procedural criminal provisions as well as the provisions on international cooperation in criminal matters related to cybercrime and the collection of evidence in electronic form. Regulation 2018/51/EU, of 31 January 2018, was published in January, laying down rules for the application of Directive (EU) 2016/1148 of the European Parliament and of the Council as regards a further specification of the elements to be taken into account by digital service providers for managing the risks posed to the security of network and information systems, and of the parameters for determining whether an incident has a substantial impact. More recently, Law 46/2018, 13 August 2018 was published with the Portuguese legal regime for cyberspace security, which transposes the above-mentioned Directive. The Cybersecurity National Centre was established as the Portuguese national authority for cybersecurity, and a cybersecurity incident response team was created. On 29 March 2018, Council of Ministers Resolution No. 41/2018 came into force, which approved the minimum technical requirements of network and information systems that are required or recommended to all services and bodies run either directly or indirectly by the state. A new national strategic plan for radio spectrum (PEE) was approved by Anacom on 10 August 2016. PEE establishes strategic guidelines for the provision of frequencies used by civil radio services and applications, satisfying spectrum requirements and the specifications of each service or application.32 However, the entry into force of PEE does not result in any immediate change to the National Table of Frequency Allocations. According to Anacom, the intention of PEE is to examine key themes common to all radio spectrum bands in order to explore a strategic approach to spectrum planning. Particular attention has been focused on DTTV, with the government approving a new policy regarding the reservation of capacity required to expand the provision of programme services in the DTTV platform (Resolution of the Council of Ministers No. 37-C/2016, of 8 July). Following such new policy, the Parliament approved, on 24 August, Law No. 33/2016, which supports the expansion of the provision of DTTV programme services, and establishes technical conditions and price control over the DTTV signal transmission and broadcasting service. Anacom has approved the methodology for setting and reviewing the reference speeds associated with coverage obligations in the 800MHz band for companies participating in the (4G) multiband auction, which, in May 2015, was subject to public consultation and prior hearing proceedings. Apart from the above, the last major initiatives regarding spectrum management were the refarming of the 900MHz band in 2010 and the multiband auction of 2011. The multiband auction allocated the rights of use for frequencies in the 450MHz, 800MHz, 900MHz, 1,800MHz, 2.1GHz and 2.6GHz bands. The auction was launched following a memorandum of understanding concluded on 17 May 2011 between the government and the International Monetary Fund, the European Central Bank and the European Commission, after possible distortions in the mobile electronic communications market were identified. 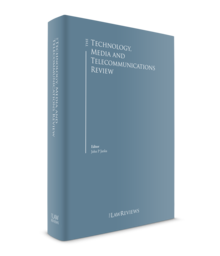 In August 2014, the first assessment of the mobile electronic communications market under the multiband auction regulation was published. The main conclusions resulting from the assessment were that the spectrum combinations of MNOs are very similar and do not lead to competitive distortions; the refarming process did not confer an advantage to MNOs, because they all held rights of use for frequencies in equivalent amounts of spectrum in the 900MHz and 1,800MHz bands; and the allocation of rights of use in the scope of the multiband auction did not contribute to creating distortions. According to these conclusions, Anacom holds that there are currently no grounds for any regulatory intervention with regard to the allocation of spectrum, and spectrum is still available to allocate according to market needs. 2018 saw the conclusion of Altice's intent to enter into an agreement to acquire Media Capital on 14 July 2017. The concentration would consist of MEO gaining exclusive control of Grupo Media Capital, SGPS, SA (GMC) through the acquisition of the entire share capital of Vertix, SGPS, SA, a company that holds shares representing 94.69 per cent of the capital stock of GMC; and the launching of a public acquisition transaction covering the representative shares of the remaining 5.31 per cent of the share capital of GMC. The acquisition, notified to the Portuguese Securities Market Commission on 18 August, arrived two years after the acquisition of PT Portugal by Altice, which raised a series of concerns regarding the concentration of several media companies into a single group and its competitive implications in the sector. For this operation to be possible, not only the opinions of the regulators, ERC and Anacom, had to be heard, but also the opinions of those with an interest in the purchase's operation, namely related companies and those with an indirect interest. The decision to clear the acquisition, for a turnover of €440 million, fell to the AdC, which had to consider whether this concentration operation undermined the principles laid down in the competition law, or if it would open the way for Altice to exercise a dominant position in the telecommunication, media and advertising sectors. Within the designated period, Anacom delivered to the AdC its opinion on the operation of concentration between MEO and Media Capital, which would translate into a complete vertical integration of the value chain, internalising into the same group the commercial relations between the production of content, the wholesale supply of television and radio channels, and advertising on and distribution of the TV service. In its opinion, Anacom concluded that the deal would lead to susceptibility of creating significant barriers to effective competition in the various electronic communications markets, where final consumers would be the ultimate losers. As such, the concentration should not be allowed under the terms that were proposed. While the operation itself was subject to more 'twists and turns' than are here summarised, notwithstanding, as of 19 July 2018 the AdC declared the termination of the proceeding relating to the Altice/Media Capital concentration. This termination decision was taken by the AdC in response to MEO's request for withdrawal of the notification procedure for the concentration, which was adopted on the assumption that the concentration in question would not materialise. Among other aspects, according to the analysis carried out by the AdC, Altice would have, as a result of Grupo Media Capital's control, a level of economic power that would give it the capacity and incentive to implement several strategies to close the markets to competitors, which would result in a significant increase of costs for its competitors in the pay-TV and multiple-play services markets. These cost increases – which the Commission estimated could exceed, in certain scenarios, €100 million per year – would lead to a decrease in competitive market pressures, ultimately reflected in the final consumer prices. Once again, we emphasise Anacom's intervention in ordering changes to offers that violate net neutrality and roaming rules. These measures are designed to prevent discrimination between content or applications, or both, included within general data allowances (made subject to blocking or delays upon depletion of these allowances), and other content or applications, or both, covered by specific data allowances or not subject to data traffic limits (not made subject to blocking or delay when the overall data cap is reached). Such discrimination undermines the principles of open internet, which is prohibited by the TSM Regulation (Article 3). We are waiting for the rollout, as Anacom also set a deadline of 30 working days for operators to outline how they will comply with this decision, and what conditions they impose on entities interested in including applications or content, or both, in zero-rated and similar offers, which shall be published. The government has updated its digital agenda through Resolution No. 25/2015 of 16 April in order to align it with the Digital Single Market Strategy for Europe and the Partnership Agreement for Portugal 2014–2020. the promotion of innovation in ICT and the enhancement of R&D potential through a 10 per cent increase in direct public funding for ICT R&D (compared with figures for 2012). prohibition of the collection of any amounts associated with the additional traffic without the express consent of the subscribers. After hearing MEO on the draft decision, approved on 18 August 2017, by a decision of 31 August 2017, Anacom determined that the provision of additional traffic (indeterminate) can only be accepted if take up of the offer results from an express and prior manifestation of consent by the customer. As such, by a decision of 31 August 2017, Anacom ordered MEO to ensure that take-up of the offer in the context of the campaign launched on 8 August 2017 is based on an express manifestation of will by its customers; and not charge or bill any sum for the provision of services to which this determination refers, without subscribers having previously manifested express consent as previously referred. In the same decision, it was also determined that MEO should report to Anacom, within 10 working days from the date of notification, detailing the manner in which it has accomplished compliance with the stipulated measures, submitting supporting evidence of the measures undertaken, without prejudice to any other evidence that ANACOM may request. those initiatives regarding the review of the electronic communications regulatory framework that were already known about. The National Civil Aviation Authority, ANAC, had previously approved Regulation No. 1093/2016, published on 14 of December 2016, which established the operating conditions applicable to unmanned aerial vehicles, commonly referred to as drones, taking into account, inter alia, the organisation of the airspace and the rules of the air contained in Commission Implementing Regulation (EU) No. 923/2012, of 26 September 2012, as well as the various existing conditions, with regard to the places where aircraft may or may not be used. Notwithstanding the above-mentioned Regulation, which essentially was aimed at ensuring air safety by adopting rules of an operational nature that would allow the addressing, in a preliminary way, of the risks of the excessive use of this type of aircraft in Portugal, the issue required further legislation. As a result, Decree-Law No. 58/2018 of 23 July was approved, establishing a compulsory civil liability registration and insurance system applicable to unmanned civil aircraft (drone) systems. Drone operators must register with ANAC in accordance with the terms of this Decree-Law within a maximum period of 60 days from the date of availability of an electronic platform for such purpose. The register is valid for a period of five years, expiring at the end of its term if it is not renewed. The fines for non-compliance vary from €2,000 to €3,500 for a natural person and between €5,000 and €75,000 for a legal person. Regarding the Portuguese Data Protection Law, on 26 March 2018, the government introduced Law Proposal No. 120/XIII for the implementation of the GDPR. However, it was not approved. The draft bill that will revoke the previous law is still being discussed at the Parliament. Notwithstanding, on 25 May 2018, CNPD released a statement clarifying that while the adoption of national legislation implementing the GDPR in Portugal is pending, the previous law will remain in force insofar as it does not conflict with the GDPR, and CNPD will proceed with the tasks and powers bestowed on it by the GDPR. CNPD also launched a public consultation of the list of the kind of processing operations that require a data protection impact assessment in accordance with Articles 35, No. 4 and 57, Letters 1, k). A period of 30 business days to submit any views began on 6 August 2018. It is predicted that the government will continue to focus on network neutrality, data security and cybersecurity, privacy and data protection (particularly following the implementation of Regulation (EU) 2016/679 of the European Parliament and of the Council of 27 April 2016) in the next few years. The security of the network and information systems will be a key issue in the future following the adoption of Directive (EU) 2016/1148 of the European Parliament and the Council of 6 July 2016 concerning measures for a high common level of security of network and information systems across the Union, and all Member States must implement the Directive in their jurisdiction no later than 9 May 2018. The adoption of a new ePrivacy Regulation, which continues to be under fire, is still pending, meaning it will remain on the agenda during the next year; both the European Data Protection Supervisor and the Article 29 Working Party have expressed their concerns and made recommendations. The final approved version of this Regulation is hotly anticipated. Cybersecurity is necessarily of major interest, as the EU plans to invest nearly €486 million to build a European infrastructure of supercomputers – the EuroHPC Joint Undertaking35 – which will be essential for processing large amounts of data, thereby benefiting society in areas such as health, renewable energies and cybersecurity. Supercomputers are needed to process ever-larger amounts of data, certainly bringing benefits to society in many areas, from healthcare and renewable energy to car safety and cybersecurity. We anxiously await the development of such undertakings as, at the present time, and mainly due to a lack of resources, European scientists and industries increasingly process their data outside the EU when their needs are not matched by the computation time or computer performance available in the EU. This inevitably threatens privacy, data protection, commercial trade secrets and ownership of data, in particular for sensitive applications. The Law37 regarding cybersecurity measures to ensure a high common level of network and information security throughout the European Union has just been published, and we are keen to witness the unfolding of its applicability. Data protection, network and information security, and cybersecurity will certainly be the key words for the rest of 2018 and into 2019. 1 Jaime Medeiros is a partner, Carolina Ribeiro Santos is an associate and Ana Ramos Logrado is a trainee lawyer at Coelho Ribeiro & Associados. 2 Available for consultation at https://www.anacom.pt/streaming/09032017Annex1InfoTecnicCB.pdf?contentId=1412954&field=ATTACHED_FILE. 3 The Radio Equipment Directive (2014/53/EU) (RED) has been applicable since 13 June 2016. It was in a one-year transitional phase until 12 June 2017, and revises the Radio and Telecommunication Terminal Equipment Directive (1999/5/EC). The new RED was adopted on 16 April 2014, and EU countries had to transpose it into their national law before 13 June 2016. 4 Available for consultation at http://eur-lex.europa.eu/procedure/EN/2013_309. 5 Commission Implementing Regulation (EU) 2016/2286 of 15 December 2016. 6 The notice of 20 February 2017 is available for consultation at https://www.anacom.pt/streaming/inicioProcedimento20fev2017.pdf?contentId=1405000&field=ATTACHED_FILE. 7 Regulation No. 829/2016 of 23 August. 8 Notice No. 2477/2017 of 20 March 2017 is available for consultation at https://dre.pt/application/file/a/106581250. 9 Available for consultation at https://www.anacom.pt/streaming/Relatorio_Contas_2017.pdf?contentId=1436237&field=ATTACHED_FILE. 10 This section does not consider bundles that include only mobile services, available at https://www.anacom.pt/streaming/bundles1Q2017.pdf?contentId=1414539&field=ATTACHED_FILE. 11 The TCB is a regular study developed by Marktest for the telecommunications sector. The universe of the Telecommunications Barometer Fixed Network comprises homes located in mainland Portugal and in the autonomous regions of Madeira and the Azores. A sample is compiled on a monthly basis that is proportional to and representative of the universe, corresponding to 1,150 interviews per month. Analysis of the TCB data is undertaken for quarterly periods. The sample of households guarantees a maximum absolute margin of error of 1.7 percentage points (questions put to all households). 12 Available for consultation at anacom.pt/streaming/Bundled_Services2017.pdf?contentId=1435794&field=ATTACHED_FILE. 13 COM.escolha allows people to see which tariff is best suited for each consumer's needs. Available for consultation at https://www.anacom.pt/tarifarios/PaginaInicial.do. 17 The legislative amendments intend to promote an environment of full competition in the provision of postal services. 19 The remaining commitments may be found in an AdC statement available at http://www.concorrencia.pt/vPT/Noticias_Eventos/Comunicados/Paginas/Comunicado_AdC_201723.aspx. 20 BEREC guidelines on the implementation by national regulators of the European net neutrality rules, available at berec.europa.eu/eng/document_register/subject_matter/berec/regulatory_best_practices/guidelines/6160-berec-guidelines-on-the-implementation-by-national-regulators-ofeuropean-net-neutrality-rules. 21 Regulation (EU) 2016/679 of the European Parliament and of the Council. 22 Law 67/1998, of October 26. 23 Law No. 78/2015 of 29 July entered into force on 30 October; see Section 1. 24 Law No. 5/2004 of 10 February (as subsequently amended). 25 Decree-Law No. 7/2004 of 7 January (as subsequently amended). 27 Implementation of the EU regulatory framework for electronic communication – 2015, available at http://ec.europa.eu/transparency/regdoc/rep/10102/2015/EN/10102-2015- 126-EN-F1-1.PDF. 28 Available for consultation at https://www.anacom.pt/render.jsp?contentId=1416152. 29 Regulation No. 58/2005 of 18 August, amended, republished and renumbered by Regulation No. 87/2009 of 18 February, as amended by Regulation No. 302/2009 of 16 July, and amended and republished by Regulation No. 114/2012 of 13 March. 30 Proc C-293/12 and C-594/12; C-203/15 and C-698/15. 31 Council of Ministers Resolution 36/2015. 32 Approval given to national strategic plan for the radio spectrum, available at www.anacom.pt/render.jsp?contentId=1393464#.V9g3nU_fM3E. 35 A new legal and funding structure that shall acquire, build and deploy across Europe a world-class high-performance computing (HPC) infrastructure. It will also support a research and innovation programme to develop the technologies and machines (hardware) as well as the applications (software) that would run on these supercomputers. 36 The EuroHPC Declaration, at that date, was also signed by France, Germany, Italy, Luxembourg, the Netherlands and Spain.